On The Spot Theatre Company presents a feast of farces with this double bill. For the first course, enjoy Pete Blatchford's new adaptation of the short story, The Open Window, by Saki. Follow the unexpected exploits of the mild-mannered mushroom collector, Framton, as he heads by train into the idyllic countryside of England for a cure for his nerves only to find that others have a different idea of what might be best for him. 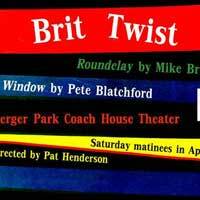 In this world premiere of Roundelay, by Mike Brayndick, savor a second course of rollicking farce featuring the former production team of a British telly mystery series reunited by the joyfully diabolical actor Amelia, who wants to do good in her own fashion.